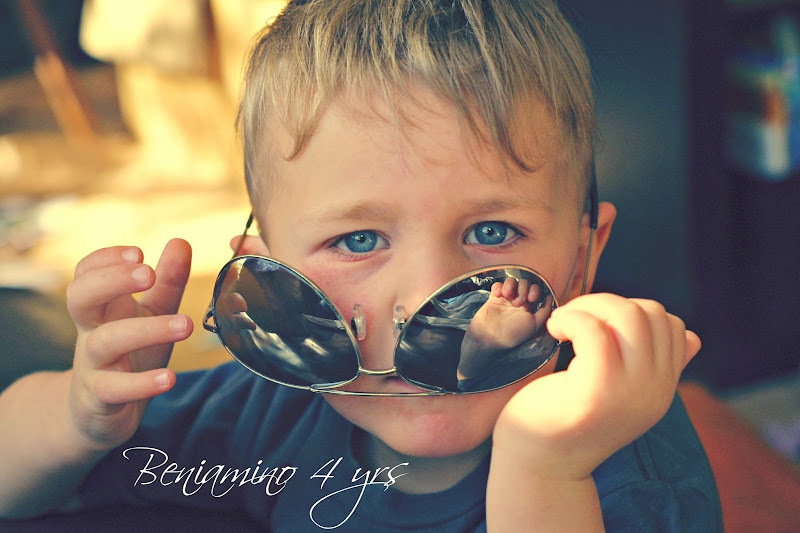 I can't believe this delightful little boy is FOUR today! And ever since then his whole life has been dramatic. Not in a bad way, just in the way he lives each day. With a lot of drama and 'bigness'. He's a funny wee boy. Gosh we laugh A LOT at him and with him. If any of our boys were to run into the only tree in the middle of a large field, it would be Beni. Probably cos he runs with his head down, watching how fast his feet are going. If any of our boy are going to be a popstar, it would be Beni. Singing, dancing, acting, sensitive, creative with a sponge-like memory for movie quotes and song lyrics. And looking good while doing all of these. When I kiss him goodnight or goodbye or just a general 'I love you' kiss, Beni makes it into a movie-worthy moment. Arms around my neck, head tilted and a slow-motion, lingering kiss ensues. It's all I can do to keep a straight face and not burst out laughing. Oh no, it's very important to pull back slowly after the kiss and look tenderly into his eyes and confess your undying love for him. HAPPY BIRTHDAY to you darling boy! Gosh I am so thankful you are my son! and raise to be a confident, loving, kind and wise man. I love you to the moon and back 20 billion trillion times. Hmm...have you got a link to that birth story...sounds like a cracker!